The 2017 class includes 50 teens from across the state. 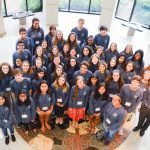 OMRF has selected 53 teens for its fourth class. OMRF has chosen 46 students from area high schools as its newest class of teen leaders.